There was a time not so long ago when people bemoaned the lack of French cuirassier sets, or at least the lack of decent quality ones. How things have changed. This set is the seventh to cover this very popular subject, and more have materialised since. Happy days indeed for those with a love for these very impressive cavalrymen, but Strelets have already made three sets of these horsemen, so what does this new set offer? Of course the first thing it offers is more poses. 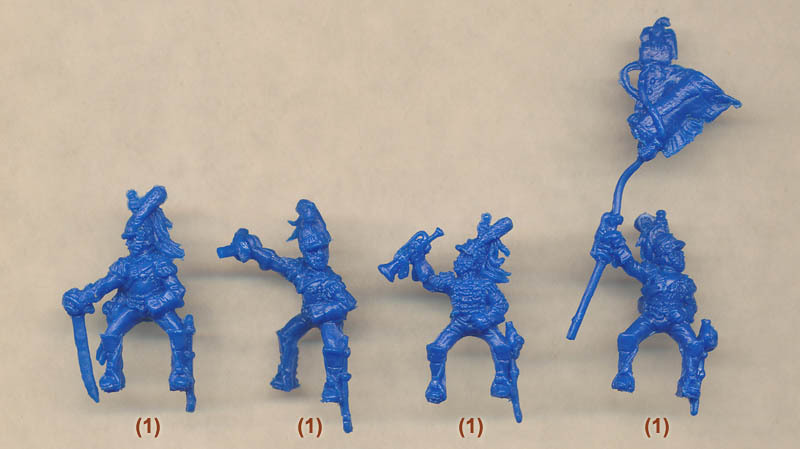 One of the older Strelets sets had the men in winter uniform, but the remaining two are effectively exactly the same uniform as those in this set, so what it is doing is expanding the available figures. The men in the Borodino set were fairly inactive but the 'Summer Dress' collection were much more combative, and the same goes for these men. While the poses are all new there is no real difference in theme between these two sets, so this is really simply 'French Cuirassiers in Summer Dress, set 2'. This time many of the poses (six to be precise) have ring hands into which separate swords can be placed. Otherwise it is more of the usual waving of swords in the air, which is certainly appropriate. Because of the difficulty of producing such a figure there is still no classic pose of man charging with arm and sabre pointed forward, which is how the charge was meant to be carried out. Still all these poses are reasonable and usable. The French cuirassier uniform is familiar to many and that on these men is just the same as the previously mentioned Strelets sets. All the men have plumes (which were often not worn in battle) and most have a musketoon and ammunition pouch suspended from a crossbelt, although none have a bayonet scabbard. Of course the cuirass is the most noticeable item of uniform here, but everything has been done accurately. Another feature this set shares with its predecessors is the sculpting style, which suggests either the same sculptor or a well matched style between them. The usual Strelets chunky appearance combines with shortened muskets, sabres and scabbards to give their characteristic appearance but this series is amongst the best figures so far made by Strelets. The horses have not previously appeared in a cuirassier set and are generally in better poses than previous attempts. Two problems with this set are worthy of note however. First, it suffers from many of the riders having their legs too close together, making the fit on the horse very tight and at times liable to spring back off. Second, and rather more obviously, we need hardly comment on the mess that is the flag and eagle. The box carries a picture of the intention, which was for the pole to be carried aloft at an angle, but something has gone wrong during the mould making process (not enough room perhaps?) and the result is rather silly and extremely hard to rectify as the plastic is the traditional sort that resists attempts to permanently change its shape. So as a further set of French cuirassiers this is a fine expansion on the two Strelets sets that have gone before. While we found that we had to slightly enlarge all the ring hands to accept the swords, the engineering is otherwise good with hardly any flash. The separate swords do not hide the relatively flat and somewhat stiff poses but this is no worse than many sets, including those that match this one, so if you can always use more of these stocky fellows then this set is for you.